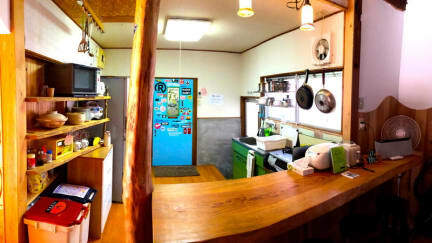 Charming and personal guest house located just a 5-minute walk from Okuragahama beach, the Guest House Pumping Surf offers a great place for surfers and others interested in the beach activities. Great atmosphere with barbeque facilities and other common spaces allows to meet other guests and share experiences. Accommodation is available in different room sizes, from up to 3 people to up to 8 people. Wireless internet, shared kitchen, washing machine and free parking also provided. Family friendly accommodation, pets are also allowed. Non-smoking facilities. In case of cancellation or modification, please contact the guest house immediately. If cancelled from 5 days to 2 days prior to the check-in date, 50% of the room fee will be charged. If cancelled after that or in case of no-show, 100% of the room fee will be charged. This place is a surfers paradise. No board or wetsuit included, you can rent from the owner who will go surfing with you every morning at sunrise. The hostel is cozy, comfortable, quiet and stunningly perfect for a surf trip. You can even rent golf clubs for the 9 hole golf course a little ways away. He'll pick you up from the train station but I walked and it was half hour walk. Not bad at all. You can hear the waves crashing from the house. Theres a bike to go to the grocery store. heaven. A total surprise! Really nice house and walking distance to a beautiful beach! I will absolutely stay here again. cool laid back surfers' hostel with awesome surfer owner. close to the beach. loved it ! Great place to stay if you are looking to relax! Masa was a great host and we enjoyed meeting the rest of his family including his two young sons who are both already accomplished surfers at ages 5 and 6. The hostel is located next to a beautiful sandy beach which one accesses through a quick walk through a forest. There are ample surf boards to rent and Masa is also an accomplished surf instructor. He also speaks English quite well. I would like to spend more time there next time. Great spot walking distance to good surf beach. Also have a great kitchen. Love this place! Great place close to the beach - 5 min walk. This is a very small town so come for the surfing I guess but not much else to do here (although they are building a skate ramp). I just passed through for the night so only checked out the 7/11 up the road. Just need to raise the shower head higher in the bathroom. It's a bit low for anyone taller than a dwarf! =D Very nice hosts though and they even picked me up from the station as it's quite far away. A fantastic hostel for surfing. Only 5 mins walk to the beach and a great chill out area in the courtyard. There were not many guests when we stayed so can't really comment on the atmosphere. The staff (The owners) live next door with their family and were always super friendly and helpful, including lifts to the supermarket and train station. Surfboards, wet suits, bikes and skate boards are all available to rent. Great hostel if you are looking to do nothing but surf! The living room is really fun. Can get kind of busy in there though. One guy was blow drying his hair at the kitchen counter. The court yard is pretty and it's a shame I was there in the early spring and couldn't see it all green. The owner was nice and I liked her 2 dogs. I slept well.